Main living area comfortably accommodates you and your guests for lounging around while taking in the views having a afternoon snack at the bar top or sitting down to a meal in the dining area. 2 full bathrooms, one on each floor of this 2 level condo. 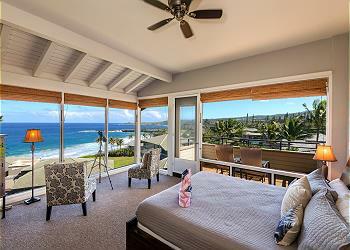 Walk up the short set of stairs to the master suite, complete with breath taking ocean views and its own private lanai. Get away from it all in your master suite. Perfectly situated just steps away from the Ocean. Nicely equipped full kitchen with all utensils and appliances. One of 3 property swimming pools and BBQ areas are conveniently located steps away for you to enjoy. Kapalua offers championship golf courses, fine dining, walking and hiking paths, shopping, spa, fitness center, tennis, expansive acres of property to walk, bike or drive, near by zip lining, several bays and beaches including DT Flemming and Kapalua Bay which are great for snorkeling, surfing, boarding or just relaxing. Kapalua Bay Villas provides a complimentary shuttle within the Kapalua Resort, which include golf, shops, restaurants and the world class spa.